I laugh at myself quite often. Like right now for instance- I am attempting to crochet a blanket during the hottest time of our little Southern California year. I kid not- this past week we've reached the 90's. Don't laugh...that's hot for where I live. We literally spend our entire year stuck in the 60's and 70's. In the winter we reach 50. In the summer, maybe 90...but mostly 80. It's a strange thing. To be honest, I didn't really know what I was doing actually. I started this blanket with minimum knowledge of what I was actually doing. All I knew was from the first day I learned how to crochet I wanted to...one day...eventually...work my way up to a blanket. I had no idea when that day would come however. Then I saw this blanket and fell in love. I decided right then and there it was time. I would begin my blanket. It was July and I would begin my blanket. I'm hoping to have it finished in time for the cooler months ahead. At the rate I'm going, that just might happen! Here was the little problem I ran into- the lovely Rebekka who was creating this lovely wavy blanket herself, wasn't going off a pattern. She was simply making it up as she went. So her "instructions" on how to complete such a blanket were...well...sparse. So I took her one sentence worth of "how to" and played around one night while watching a movie with the hubby. 2 hours, 4 completely unraveled tries, and one "almost" breakdown later I had it going. Success! To her defense, she did say she'd have the full pattern up on Ravelry once her blanket was finished. I, however, couldn't wait one minute longer. I was so in love with the idea and look that I had to begin ASAP. So me. Funny little bit about this: I went from, "I'M GOING TO MAKE A WHOLE BEDSPREAD FOR US!" to "Ehhh...maybe I'll try making a throw blanket first..." I then "measured" a throw blanket I liked the size of, "added a little more width" (you know, so we could BOTH be under it) and then got carried away and just way too into our movie we were watching...because now my "throw" blanket is the width of our bed. Go figure. Bedspread sized throw blanket, here I come! 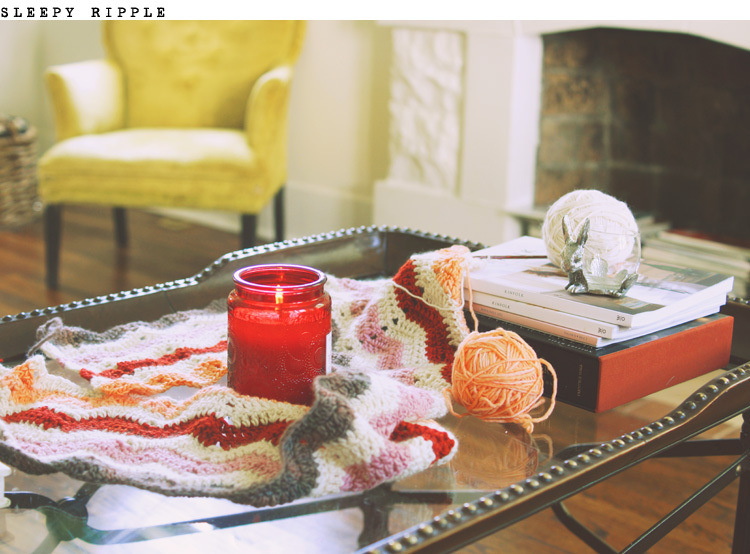 "...basically, it's four double crochets, then double crochet three times into one stitch (to make the "hill"), four more double crochets, and then skip two stitches to make the "valley". Over and over." Yes, those were the instructions...Again...my impatience got the best of me. Anyway, then there's the yarn! Oh this yarn!! It's basically amazing and could possibly be my favorite. I was given a few of these skeins in "Cream" and "Golden" as a "Welcome to crocheting" present, months ago. I then have since returned to the store to purchase some of the most gorgeous blue mix- "Ocean". Ocean's yarn goes from a blue-grey stormy sky color to a deep purple, then showcases a bright blue sky inspired hue. I love it. The colors you can choose from in within this brand are incredible. I love each and every one. Hard to commit to one, two or three...I wanted a blanket made out of all of them. It's soft, heavy, and warmer than I could have ever imagined. Having crocheted enough to lay across my lap now, I'm both sweating my face off while smiling ear to ear- I just know come the cooler months this is going to be so wonderful. The perfect yarn for what I am going for. I have big plans to snuggle under it with the hubbie and watch movies...or curl up under it and take afternoon naps in the grey-sky-weekend days. Ahhhh homemade things, how I love you so. What lovely crafts are you all working on? That's great!!!!! That's so exciting! Wow nice! I love all things crochet. I wish i know how to crochet too. I'm working on something sneaky. I am stealing my husband's favorite t-shirts - you know the ones that are starting to get holes, that he has out grown, and really really needs to stop wearing because quite frankly sometimes he looks more like a boy than a man?? This made me laugh!!! What a great thing to do! I'm all for it. I once made a super snuggly pillow out of one of my husband's favorite shirts.....it was a massive failure and basically was the worst pillow anyone's ever seen. he loved it but couldn't use it. This is why I don't sew. Oh! Hehehe. That would be so fun. I've come to wish I lived near so many of my new blog friends! Crocheting is SO easy though! Once you are shown the basic stitches there's no stopping yourself! oh my gosh that's gorgeous! i wish i had the crafty chops to make something that beautiful!